Make up ½ litre lime jelly, then chill. When cool and just starting to set, whisk in 300g cold Waitrose Natural Fat Free Bio Yogurt. Pour into 4 wine glasses and place in the fridge to set. 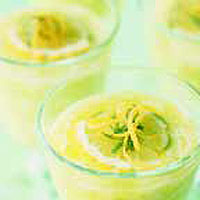 Serve topped with lemon or lime slices and some grated lime zest or 1 tablespoon Waitrose Natural Low Fat Set Yogurt.